Marcus had a relatively normal life until he starts seeing some strange hallucinations. While at detention he hears a crash and sees a strange man with a key. When he goes to check it out he sees a bull and it starts to chase him but nobody else sees it. He tells his two friends and they don’t think he is crazy but they don’t know how to explain it. Then more crazy stuff happens and he finds out who the ghost man in and goes to his wife’s house and finds out a few things like there is a key that his biological father wanted him to have and she gives it to him. This opens up a whole new world because when you put the key close to a door it opens up a different door and that is how he enters The Library. The Library is pretty cool as it’s a library that holds unfinished books and it has agents who go about trying to finish them so the spirits can rest. So basically if someone is murdered and nobody figured out who did it then that book is still open until someone can figure out. Everyone has a book and spirits are always there taking down the notes that make up your book. 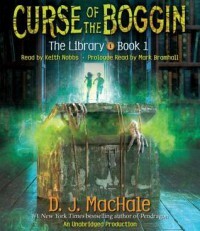 Marcus doesn’t really want anything to do with this Library but he really has no choice because a boggin is on the loose and it wants the key so it can destroy the library and it could be going after his family or friends. So Marcus, Lu and Theo have to try and figure out how to trap the boggin. I really liked the characters and they were really an oddball sort of pairing which reminded me of my friend when I was young. Marcus is cool and he doesn’t let anything bother him. He stood up to a teacher for bullying and got detention and he thought it rocked. Lu is a rollerskater who loves doing the roller derby, and Theo is the smart and analytical one of the group. Theo has a hard time believing in the supernatural even when he sees it with his own eyes, I really like him. This was a really good introduction to this series about this fun and interesting library. I really enjoyed getting to know the characters and following the adventure. I think this one is great for young readers who like fantasy adventure reads and for adults too.